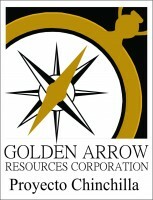 Golden Arrow Resources is a Vancouver-based exploration company focused on creating value by making precious and base metal discoveries and advancing them into exceptional deposits. The Company is currently focused on its Chinchillas Silver Project located in the mining-friendly Province of Jujuy, Argentina. Exploration has progressed rapidly since the acquisition of the project in late 2011. With the innovative transaction announced in October 2015, the Company is now positioned to maximize shareholder value by fast-tracking Chinchillas to production and becoming a 25% owner of the world-class Pirquitas silver mine.